Well, in this case, there is a approachable solution for designing an inverter that meets the demands of this hypothetical – albeit demanding – boss. So before you start defining the specified power stage, current sensing and protection circuit, it is important to consider a very real and accessible reference design for 48-V/500-W three-phase inverter with smart gate driver servo drives. 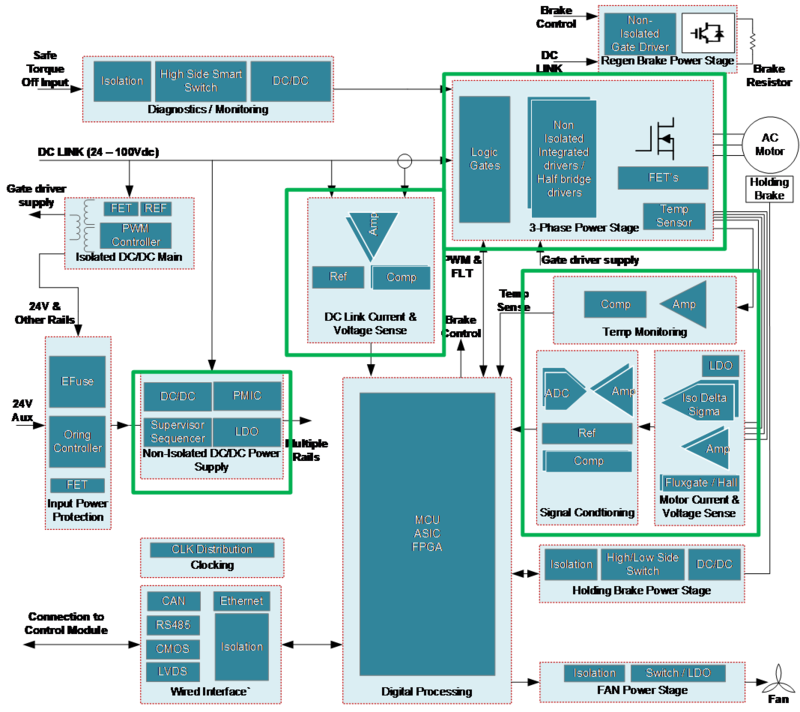 This reference design achieves a small form factor using highly integrated ICs that include three half-bridge gate drivers with 100% duty-cycle operation. Selectable source/sink currents from 50 mA to 2 A. VDS sensing enables overcurrent protection which prevents damage to the power stage and motor. The VGS handshake feature protects the power stage against shoot through due to the wrong pulse-width modulation configuration. Find out why efficiency, protection, and integration are important design factors for compact DC-fed drives up to 60VDC. A typical low-voltage DC-fed servo drive power stage can be partitioned like Figure 1, which is based on the DC-fed servo drive power-stage module. The boxes outlined in green are the modules. The covered modules of the low-voltage DC-fed servo drive in Figure 1 have a huge impact on system performance and affect the design considerations. A robust system can be built by adding fault detection to the half-bridge gate drivers for VDS sensing and soft shutdown. These features allow the gate-driver system to detect typical overcurrent or short-circuit events. That is done without adding extra current sensing or hardware circuits to enable dead-time insertion which ensures that the MCU can’t provide a wrong drive signal that can cause damage to either the power stage or the motor due to a shoot through-short circuit. One consideration is optimizing efficiency to reduce cost for the heat sink and radiated emissions (EMI) versus the switching speed. Implementing these features with 100-V single- or half-bridge field-effect transistor (FET) gate drivers requires additional active and passive components, which increases the bill of materials (BOM) cost and printed circuit board size, while often reducing the flexibility to modify parameters like the strength of the gate drive. When analyzing the system efficiency the current sensing circuit, FETs with low RDS(on) and a low gate charge to enable fast switching, effect the system efficiency performance. Typically system designers want to achieve 99% efficiency of the power stage. To allow for continuous phase current sensing with minimum losses 1-mΩ inline shunts were used in the reference design. The resistor value was chosen as a compromise between accuracy and efficiency. A major challenge for non-isolated inline amplifiers is the wide common-mode voltage (0V to 80V) used for the system, considering the shunt full-scale voltage is ±30mV in this reference design (designed for ±30Arms). This is a small signal compared to the common-mode voltage of 48V. Therefore, a current-sense amplifier with a large common-mode voltage range and very high DC and AC common mode rejection is required. Due to the low shunt impedance, an amplifier with an additional integrated fixed gain and zero offset further helps reduce system cost while ensuring highly accurate current measurements. An 100-VDC buck regulator creates an intermediate rail from the DC input to supply the gate driver and point of load. The power stage needs to work at high efficiency to reduce self-heating this is needed to meet the industry ambient temperature of operation which is typically 85°C. With this in mind it means that the IC’s used in the system needs to support even higher temperatures, as the electronics will always have some temperature increase (self-heating). The reference design for servo drives was tested from 0 to 500W output power with a PMSM motor the motor load was controlled with the Dynamometer as shown in Figure 2. The 48-V/500-W three-phase inverter with smart gate driver reference design for servo drives shows how to design a compact hardware protected power stage with low BOM count, in-phase current sensing, fault diagnostic capabilities and high efficiency. This is achieved using TI’s DRV8530 100-V three-phase smart gate driver with buck regulator and INA240 80V, low-/high-side, bi-directional, zero-drift, current sense amp with enhanced PWM rejection which enables optimization of a low-voltage DC-fed power stage, for more details on the system performance and IC’s used go to the reference design guide. Learn more about TI smart gate drivers for low-voltage systems. Discover more about TI motor drives and integrated gate drivers.